The Hickory Crawdads have announced details of Nickelodeon Night on Saturday, June 10 at 6 p.m. featuring the Mighty Morphin Power Rangers. 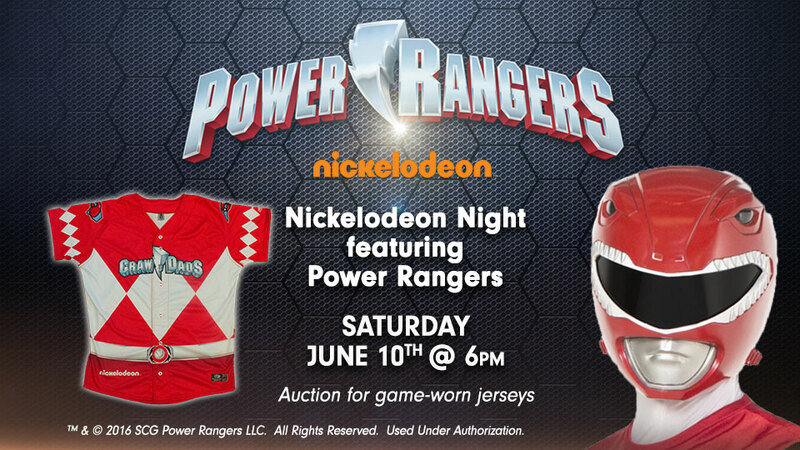 Hickory, NC - The Hickory Crawdads have announced details of Nickelodeon Night on Saturday, June 10 at 6 p.m. featuring the Mighty Morphin Power Rangers. The night will include Power Rangers-themed music and on-field contests. The Crawdads will also be sporting special themed jerseys, inspired by the original Red Mighty Morphin Power Ranger suit. An online auction of the game-worn jerseys is live now and will run until Saturday, June 10 at 12:00 p.m. The auction will conclude with live bidding at L.P. Frans Stadium up until the seventh inning of the Crawdads vs. the Lexington Legends game. As a result, the highest online bid is not guaranteed to be the final winning bid. Opening bids for jerseys begin at $75, with a minimum bid increase of $5. Proceeds from the jersey auction will benefit the American Heart Association, which will host Heart in the Park promoting family wellness, the morning of the game from 9:00 a.m. to 12:00 p.m. in front of the ballpark. Tickets for Nickelodeon Night featuring the Mighty Morphin Power Rangers are available online or by calling the Crawdads front office. After the hit series "Mighty Morphin Power Rangers" launched in 1993, Saban's "Power Rangers" quickly became the most-watched children's television program in the U.S. The series is one of the longest running and most-watched kids action series in television history with a 24-year legacy. "Power Rangers Ninja Steel," the 24th season of the iconic series is currently on air on Nickelodeon and the feature film, "Saban's Power Rangers" is now in theaters worldwide. For more information, call the 'Dads front office at (828) 322-3000. Saban's Power Rangers franchise is the brainchild of Haim Saban, creator and producer of the original "Mighty Morphin Power Rangers" hit series that launched in 1993. Following its introduction, "Power Rangers" quickly became the most-watched children's television program in the United States and remains one of the top-rated and longest running kids live-action series in television history. The series follows the adventures of a group of ordinary teens who morph into superheroes and save the world from evil. It is seen in more than 150 markets, translated into numerous languages and a favorite on many key international children's programming blocks around the world. For more information, visit www.powerrangers.com.